Laying in my bed with thoughts of shattered dreams and longing for the tenderness I've missed so much for too long, I deeply call for a prayer that would change my life for eternity. 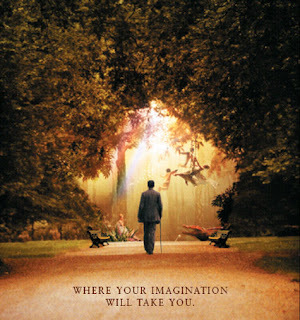 I keep asking myself this question every time I watch "Finding Neverland." Does it really exist? Will it be possible for me to live a magical life of adventures and mystical delights? What do I have to do to bring back the skill of imagination I've lost? Peter Pan had to think of happy thoughts to make it through his childhood. He blocked away all the sorrows of lonliness and poverty. He lived a much simpler life of good and evil. Everything was clear, daring, and exciting. He had friends, he helped others, and he managed to bring happiness to everyone who had ever heard of him. Isn't this what life is about? Aren't we supposed to be surrounded by people who care for us in every aspect of every day? Don't we enjoy the pleasure of giving and charity? It seems to me that Neverland is a place of hope, a place of new chances, a place of enchanting possibilities. It occurs to me that the Arabian lands were once better than Neverland. I know for a fact that there were times when everyone enjoyed their lives. And yes, it was only earth, not heaven. Why did we stop having this dream? Why is it so hard to bare the thought of being great again? Why do we keep pulling ourselves down, thinking of nothing but hatred and sufferings? Have we forgotten what it's like to dream? Hope had to leave us for a reason; we didn't deserve such gift for it to stay. Why is it, that we think of every passionate person to be gay nowadays? Is it because they're faking it? Or, is it because we simply envy them for the one thing we all long for, but do not wish to admit of missing? Life has become so diverse, and so have people. Fear, anger, and anxiety have become a requirement for you to survive. If you still trust someone, then you'll definitely be known as being naive. I do think that we lost the freedom of dreaming. Now dreams are so hard to find. However, I do think that WE are the ones who are keeping ourselves from dreaming again. Feel free to dream Noha and know that I'm dreaming with you :D I refuse to be held down. I will always fight for my power to dream. Nada, you're the sweetest pumpkin ever!